Is a Shikoku Dog the breed for me? In deciding whether or not a Shikoku dog would be a good breed for you and your lifestyle, you will need to consider a few things in advance. 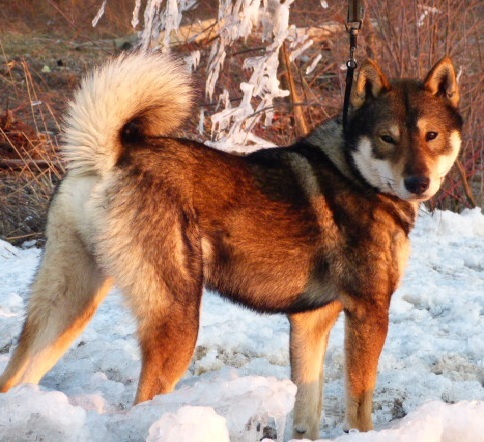 The Shikoku is a rare breed of dog even within its homeland of Japan. This means that there are few dogs available,and often there will be a wait list for puppies. Breeding stock is selectively imported from Japan which is very costly. Breeders who are committed to preserving the Shikoku outside of Japan are very protective of their Shikoku. To be considered for a puppy, be prepared to provide detailed information about yourself and your home environment. Also be aware that you can expect to pay $2000+ for a companion puppy. The Shikoku dog a special breed not only because of their rarity. This agile canine is highly prized as a hunting dog for having great endurance and intense prey drive. Of the primitive hunting dog breeds, the Shikoku is found to be the most challenging and rewarding... their high intelligence and intensity combined with great devotion and their "wolf-like" appearance provide for an awesome package. As far as environment (home), the size of your home doesn't matter to the Shikoku. What they do require is a fair amount of exercise daily, fed a premium diet, obedience training, routine vet care, and most important...quality time with their owner. They love to hang out with their owner and any dog sport participation is highly recommended. In deciding to own (or be owned by) a Shikoku, you must be committed to providing the dog with exercise, training and socialization. This breed is NOT for everyone. The dog is best for someone who is committed to being an ACTIVE dog owner. The Shikoku is primitive dog by nature and can exhibit tendencies that need the guidance of a strong leader. They are often protective of their territory and can be aggressive toward other animals. Shikoku dogs will do well in homes with other pets when properly socialized and raised together. Still Interested in owning a Shikoku dog? Please use this form to provide information concerning your interest in owning a Shikoku dog. * Please explain why you are interested in owning a Shikoku dog. Ask questions about the Shikoku dog.